Let me say up front that I am not a fan of The Rocky Horror Picture Show. I watched the film once on television long ago and found that it was not my cup of tea (pun intended). As a result, when Zagria featured its creator on her blog, I did not pay much attention to it. "Richard O'Brien --- who's he?" I thought to myself and moved on. As a result, I missed the fact that the creator of The Rocky Horror Picture Show is transgender. “There is a continuum between male and female. Some are hard-wired one way or another, I’m in between,” O’Brien revealed in an interview. Also, I did not realize that O’Brien had a role in the Rocky Horror film. Anyway, Richard O'Brien will be celebrating his 70th birthday next month and Penny, one of my readers in New Zealand, kindly informed me that there will be a big birthday bash for Richard in Hamilton, NZ on March 17 and attendees are encouraged to "dress delightfully." Here is a link to a pertinent webpage and Facebook page. I wish I could attend, but it is a bit of a drive. Happy birthday, Richard! Sorry I won't be there. I absolutely love The Rocky Horror Picture Show! I have it on both VHS and CD! I have heard NZ is rather tgirl friendly, would not surprise me. I was there a few years ago with a friend. It was very friendly, never thought of my femme side as I was there on business. Got a lot of side trips in though. Love that place. 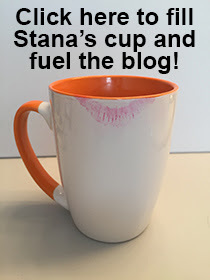 Stana, thank you for the great website. Its a great comfort to us and I visit almost everyday. I really enjoy it and I am sure others do as well. Happy BD and many more!